Robyn Gleeson was born and raised in the Hastings Area. Her real estate knowledge and experience expands over 20 years which ranks her as a “survivor” in the industry. 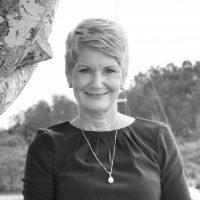 Robyn leads a large team of 36 including Port Macquarie and Crescent Head offering expertise mentoring and training with a passion for property management and human resources. Under Robyn’s management, the team have achieved numerous National awards over the years including “Elite Status” for the property management team 7 years in succession. Having recently received a prestigious personal “Excellence award” from Elders Corporate for her contribution to the industry and superior work practices throughout her time as office Principal alongside her previous business partner Bill Bodkin. What an honour to receive such distinction! Robyn is very well known and respected throughout the industry and has strong family and friendship ties throughout the region. With her personable approach, excellent problem solving skills and strong leadership, high energy skills which qualifies her for an excellent mentor and role model for the business. Robyn is married to Terry and has two adult daughters and two delightful grandchildren. She has a love of travel, fitness, very much enjoys our beautiful beaches and outdoor casual lifestyle Port Macquarie can offer. Would you like to speak to Robyn?